A Google translator phone is in the works; they are building on their text translation software, which covers 52 languages, and on their voice recognition software that powers the spoken search feature on their Android phones. Speak English into your phone, and French comes out the other end. We think speech-to-speech translation should be possible and work reasonably well in a few years’ time,” said Franz Och, Google’s head of translation services. Science fiction fans readily recognize the translator concept. It was used in outer space in such forms as the babel fish from Douglas Adams' 1979 novel The Hitchhiker's Guide to the Galaxy, the computer translator from William Gibson's 1996 novel Idoru and the communicator discs from Larry Niven's 1976 novel Ringworld. 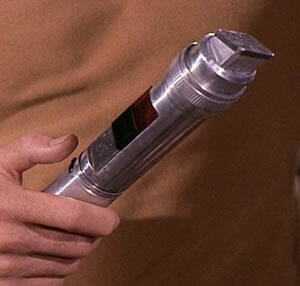 The original Star Trek series also featured a universal translator. The episode was Metamorphosis, originally aired on November 11, 1967. ...he at once understood when she said, "Pardon, Monsieur, je ne comprends pas!" Real-world machine language translation was started in the 1950's with the attempt to translate Russian intelligence documents; the machine translation of one language to another is still being perfected, as anyone who has used Google translate knows. Take a look at the LingoPhone with Mobile Translation , a five year-old technology that provides translation of text messages in Europe.